Now that the season is over, the reviews of 2007 are beginning to roll out and, amongst them, are the inevitable driver assessments. Patrick has done a very good Top Ten over at Motorsport Ramblings, so good in fact that the only quibble I have is that, like everyone else, he under-rates Scott Speed. Determined to be different, I have decided to rate the teams, rather than the drivers. And this is not about who built the best car or won the most races - we know that already; I base my assessment on how well each team has done with what it has. So, if saddled with a duff design, how did the team cope? If beset by unreliability, did they find and overcome the problem? If unable to pay for the big name drivers, did they manage to find an unexpected hotshoe amongst the pay drivers? These are the things that make a team and can ultimately bring success. 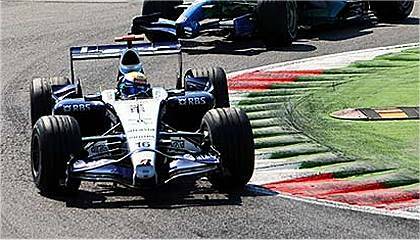 Williams had a terrible year in 2006, never looking like contenders, underfunded and apparently an endangered species as the last true independent on the grid. Their recovery this year has been all the more remarkable as a result. Financially, they found more security in much better sponsorship and a supply of Toyota engines to replace their expensive Cosworths. Driver selection was nothing if not sensible. Allowing the disgruntled Mark Webber to seek greener fields, they kept the promising rookie, Nico Rosberg, and teamed him with the reliable and much cheaper Alex Wurz. Although many criticized Alex's performances in qualifying, he delivered value for money in his ability to assist the engineers with development of the car. Rosberg was one of the revelations of the year, to the extent that we expected to see him at the sharp end of the grid after every qualifying session. The car was a great improvement over last year's, although probably flattered by Rosberg's talent, and the team got on quietly with the job of developing it thoughout the year. In a year of fuss and palaver from every side, Williams as a team kept their heads down and limited their public utterances in Raikkonen-like fashion. They showed how a team should function, dealing with problems as they appeared instead of grumbling and making excuses. With the matter of customer cars now seemingly deferred for the moment, they have hope for the future, too. So Williams get the top spot in my estimation, although only just ahead of my second choice. The Germans have a reputation for efficiency and BMW epitomized this in their 2007 performance. Everything seemed to work well for them; early problems with the gearbox were soon sorted out and, almost from the first race, it became clear that they would be the third team after Ferrari and McLaren. Their driver choice was sound and respectable: the experienced but still quick Nick Heidfeld alongside one of the bright hopes for the future, Robert Kubica. And Nick did more than was expected of him, staying ahead of his team mate in almost every race, unlike every other veteran teamed with a rookie. With the firm hand of Dr Theissen to prevent rivalry from getting out of hand, it was a pairing that allowed the F1.07 to show its quality. And it was not a bad car at all - a logical development from the previous year's design, neat, compact and pretty in its conservative colors. It was generally reliable too, the only obvious failure unfortunately robbing Kubica of a possible win in China. So efficient were the team that it was a minor sensation when they managed to get something wrong. One gets the feeling that this team will only get better, continuing its considerable momentum until the championship is theirs. Where are Ferrari and McLaren, I hear you cry. All in good time, I reply; we are looking at teams, not results, remember. And Red Bull deserve third spot for their good humor and perseverance with a car that proved difficult from the start. Yes, they suffered a mid-season bout of unreliability that scuppered their drivers' hopes of a decent showing; but they soldiered on, uncomplaining, until the problem was fixed. All that hard work paid off in the end and David Coulhard joined Mark Webber in contesting the top ten places on the grid. Not bad, considering the car had been a major disappointment at the beginning of the year. Even the fact that Webber suffered probably more car failures than in any other year and yet has not stormed off in a huff argues for the good atmosphere within this team. They're a compact, efficient little group that can only get better with time. Renault suffered more than most from the switch to Bridgestones this year yet they have kept working, somehow staying in touch with the top teams if never a real threat to their nemesis, BMW. Were it not for the ridiculous antics and pronouncements of Flavio Briatore, I would probably have placed them ahead of Red Bull. He is altogether too loud and makes a very good team with great understanding of good publicity look cheap. Pat Symonds was the antidote to Flavio's excesses, of course, together with the uncomplaining, if uninspiring, work of Fisichella and the burgeoning promise of Kovalainen. The disappointing performance of the car creates doubts about Renault's chances next year, even if Alonso does drive for them, but the team itself is a model of perseverance in adversity. Don't write them off just yet. This should have been McLaren's year. Had it not been for a wayward designer and a disgruntled Ferrari employee, a driver pairing that proved explosive, and a series of tactical errors in the last few races, they would have walked it. A better example of shooting oneself in the foot is hard to imagine. Yet it has to be admitted that, for most of the year, the team has held together under enormous pressure and it is understandable, at least, that they should fade at the end. And that is why I place them ahead of Ferrari. Ferrari looked good, then poor, then good again, then poor, and finally good. At times they were unbeatable, at others in such chaos that it seemed the good old days of Italian drama had returned. Refueling errors, unbelievable tire choices, suspect reliability, all combined to spoil Ferrari's year and it was only thanks to the mistakes of others that they managed to grab the drivers championship at the end. In fact, it was their driver choice that proved their saving grace. With Raikkonen demonstrating how to race rather than create controversy and Massa going quickly when at the front, they won their share of races. But the invincibility of the Schumacher days has departed. Give them their due, they had problems galore throughout the season but rode them out and found a new sugar daddy at the end. It is easy to laugh at the tail enders but we need to take into account such things as funding as well as mere results. After all, the greatest team of the last few decades, Minardi, was also perpetually under-funded. Unlike most people, I was unimpressed by Spyker leading a GP, since it was entirely due to a lucky tire choice, but put more store in Adrian Sutil's performances once the 'B'-spec car appeared. That was a clear leap forward that deserves more recognition of the team's efforts. Mike Gascoyne, their designer, is talking of midfield placings next year and, with their improved funding, it just might happen. Everyone's favorite team, it seems, SA amused us by beating their parent team, Honda, at most races this year. That was entirely due to Honda getting it hopelessly wrong, however, and SA's performances were variable at best. Both drivers shone at times and then threw it away at others. They occupy eighth spot merely because they were better than the three that follow. Other teams had cars that turned out be dogs, as well as Honda. The difference was that the others found out what was wrong and fixed it; Honda were completely mystified by the car's failure to perform, didn't listen to what Barrichello was telling them until halfway through the season, and then still failed to make any great improvements. Their attack on the F1 employment market merely served to highlight their problems and they seemed in total disarray, apart from the stoic perseverance of their drivers. I had high hopes that STR would embarrass Red Bull this year but that was before I realized just how bad their man management is. With a car identical to RBR's, they were close on occasion while they stuck with Liuzzi and Speed but insisted on blaming the drivers for the car's faults. The fact that Speed's replacement, Vettel, managed to score a few points late in the season was thanks to a couple of wet races where the car shone and is no indicator that the team are over their fundamental problems. I see no reason why they will fare any better next year. Loads of money, two quick drivers, experience with Bridgestones, and no results worthy of the name. It's a terrible record and can only be explained by the company's inability to understand that the team must be allowed to get on with it unhampered by decisions from the board of directors. Let them study Renault to see how a car company goes F1 racing. And that's it. Well, you didn't expect me to go along wih conventional wisdom, did you? I think Ralf hasn't quite deserved the amount of criticism he's had this year. He's had a lot of bad luck and, on occasion was as quick or quicker than Trulli. Yes, he made a few mistakes and seemed lacking in motivation much of the time, but some of that must surely be the fault of the car. Trulli was able to qualify it reasonably well but invariably fell down the order during the race - surely an indication that the car wasn't up to much. As a team, Toyota failed miserably. Others had enough drive and enthusiasm to make the best of a bad car but Toyota seemed to have no clue what to do about their bad performances. It was almost as if they just going through the motions. Perhaps, like Ralf, they're just paid too much. Initially I would have put BMW at the top but on reflection, I think you’re absolutely right about Williams. I sort of expected them to be fading away or joining Jordan in the F1 nostalgia yard but, they put up a good appearance and when I thought about it –damn surprising actually. I might take issue with Renault ranking ahead of McLaren & Ferrari. I think Fisichella was kept on a year or two too long but, with Alonso gone, I guess they opted for experience. I think it surprised me that they took such a dive this year, which is why I don’t rank them ahead of McLaren or Ferrari. I’m not sure I’d give them more than 7th or 8th. You are 100% right about Briatore, though. I think he secretly wants to be Paul Stoddart but lacks the scrappiness to pull it off. 100% on McLaren ahead of Ferrari. It should have been their year and I will always wonder if the whole “spy” thing hadn’t happened if the cult of personalities issue would have escalated the way it did. The tension inside that team must have been stifling for everyone. Anyone who has ever worked in a pressure cooked atmosphere like that knows it’s impossible to focus everyone in the same direction-or even what to focus on. Most definitely Toro Rosso. I usually like the back markers and it’s sort of difficult to place them in any context other than the emotional. It isn’t because I’m an American, honestly I never really warmed to Scott Speed but, I think that what both Speed (and Liuzzi) got was appalling. It made the whole Alonso/Hamilton show look like a b**ch splap. Reports suggest Alonso has agreed to leave McLaren. Unconfirmed as yet but no major surprise I suppose. All season long we the people have been beating up on Ralf S. but I often wonder why? Fisichella also....... Ralf seems to have bounced from car to car and never got one when that team was on the rise, Fisi has had to play second fiddle to Alonso and this year when it was his turn to be #1 the car turned sour. Of course the immediate response to that is Kova do better than Fisi ....... yes but Kova was a rookie working his way up, Fisi was a senior who saw his chance (possibly his last chance) slipping away and with it some of his enthusiasm. Where would your motivation go if you sat in a car that couldn't qualify better than 10th (Fisi) or 16th (Ralf) or worse yet couldn't FINISH !!!! I don't think these drivers are so bad, it's just the loss of motivation caused by their particular teams (negative) fortunes. One man's opinion. Agreed entirely, Number 38. I can remember when Fizzy first came into F1 he was seriously quick, obviously a very good prospect for the future. I forget which team it was but they wanted Fizzy to drive for them - it was an excellent chance for him - but Flavio vetoed it and put him in a midfield team instead. From that time onwards, Fizzy was never in the right place at the right time and I am certain those years have taken their toll. Flavio wrecked his career. As for Ralf, he too was quick when he came into F1 but a bit wild. Too many years in uncompetitive cars, too many accidents, too much comparison with his brother - that's what did for Ralfie. Sorry Clive, i just felt i had co leave a somewhat sarcastic comment on this one. You have held on to your point of wiev over Scott Speed since he first got hold of a steeringwheel, at least that's how it sounds. If you had been Ron Dennis, Scott could just as well have been Lewis Hamilton to you. But there's one substatial difference. There's just you, with maybe some others to, who think Scott is that much of a talent. If there's som many who think hes not that good, and if you look at the result he have done this far, don't you think there could be something darkening your thoughts? I know it's good to be concistent, but not beeing almost ridiculously stubborn. Sometimes it can be good to review your thoughts, and maybe re-evaluate what you think about a person. Other than that, i tink that your list here is mostly correct. But as always, there have to be difference in how achivements and performance are valued, so i think i might sit down someday to write you a new list. I'm sure you're right that my support of Scott Speed comes across as though I think he's as good as Hamilton, Björn. But this is forced on me by others who write him off without really looking at his record. Since I live in the States now, I thought it was the least I could do to take an interest in the only American driver in F1 - so I studied his results from last year and followed him through the races on VisionF1. I was quite surprised at what I found. It was true that he spent most of the time making mistakes in the first half of 2006 and managed to be quicker than Liuzzi on only one occasion; but in the second half of the season it became obvious that he was learning fast - he finished more races than Liuzzi and was beaten by him for pace on only one occasion. They ended the season on exactly the same number of finishes and faster qualifying laps. That told me that Speed was learning faster than Liuzzi (who had been in F1 a year longer than him and was pretty highly rated before STR got hold of him) and was probably the better driver by the end of the season. And the trend continued in 2007, with Speed increasingly being quicker and more consistent than his team mate. In his last four GPs, Scott qualified higher than Liuzzi and his slipping off the road at the Nurburgring was his only DNF of his own making all year (and he was in good company in not finding any grip in the lake at the first corner). Otherwise his DNFs this season were all the result of poor reliability of the car and others crashing into him. In spite of all this, I still hear people saying how good Liuzzi is and then adding that Speed was not good enough for F1. Such opinions are based entirely on ignorance of the facts - if they had been watching, it would be quite apparent that STR got rid of their best driver first. Since I happen to know the truth, having made a study of it, I feel duty-bound to point out how wrong they are and, if that comes over as if I think Speed was as good as Hamilton, then so be it. The point is that I am not saying that Scott was better than everyone else. We really don't know exactly how good he was; but we can say that he was better than Liuzzi in all departments - pace, consistency and racecraft. And, if people are going to insist that Liuzzi deserves to stay in F1, how much more so is that true of Scott Speed? It may be that he finished just as many races as Liuzzi, and that they had results at the end of the season that was almost identical. But i can not in any way believe, even if it's STR doing it, that they would draw sticks aboutwho would leave the team. Every decision made in a team have to have some kind of reason to it. It may be that he just did'nt cut it, or maybe he did'nt had the right way to work in just this team. Maybe they did'nt think he could put up the right amount of money. I have no idea what th thought's in the team was. But the fact is, and you're not the only one who have watched closely on this one, that he did just as much as could be expected of him, and not a bit more. At least when it comes to car and team development. At the times during the season when i hve heard his coments over the team-radio, what have come out of his mouth could just as well have come out of the mouth of a teenager. That, and some of his written comments have made me believe that his technical assets might not have been as good as they should. And that is one of the most important things to a racedriver i think, to understand the machine he drives and to be able to explain to the team exactly what's happening with it on the track. But even though this might be true or not, i can understand that you have found him interresting. He certainly had that special american lustre around him, that makes a man become a star while among other people.